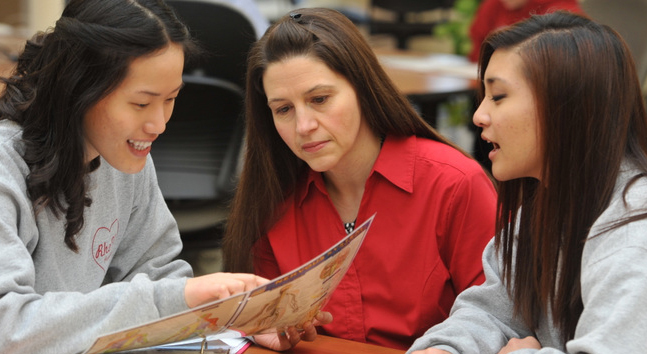 WSU offers a Bachelor of Arts in Speech and Hearing Sciences, which prepares students to further pursue a master’s degree in speech-language pathology or a clinical doctorate in audiology. Pre-SHS students spend their first two years on the Pullman campus, completing Speech and Hearing Sciences prerequisites and general University graduation requirements (UCORE). Your Health Profession Specialist also serves as your academic advisor and can help you choose coursework that will provide a good foundation to further your studies in speech-language pathology or audiology. Classes may include psychology, technical writing, business, foreign language, math and other specialty areas. After completing all of the prerequisite and UCORE courses, and earning a minimum of 60 credits, pre-SHS students transfer to WSU Spokane to complete final two years of the curriculum. Normally, students begin the master’s program application in their junior year. Audiologists diagnose hearing and balance problems, prescribe hearing aids and other assistive devices, and provide aural rehabilitation. Speech-language pathologists provide therapy to individuals with delayed language development, treat people who have experienced a stroke or brain trauma to regain language and speech functions, assist individuals with swallowing difficulties, help develop proper control of the vocal and respiratory systems, help those who stutter to increase fluency, and much more. Audiologists and speech-language pathologists work in schools and a variety of health care settings, such as hospitals and rehabilitation centers, nursing care facilities and community clinics, private practice, public and private schools, colleges and universities and other various areas. The undergraduate program is a pre-professional program. To work independently as a speech-language pathologist or audiologist, students must go on to earn their master’s in speech language pathology or clinical doctorate in audiology.Professional graduate programs generally require undergraduate work in communication disorders, chemistry, biology, psychology and statistics. A 3.0 minimum GPA is usually expected, although competitive applicants generally have higher GPAs. The application process for the WSU master’s program is very competitive, and enrolling as an undergraduate in Speech and Hearing Sciences does not guarantee admission to the graduate program. You will need to work diligently to build a portfolio showcasing your academic success, personal achievements, industry experience, career goals and your compassionate character.